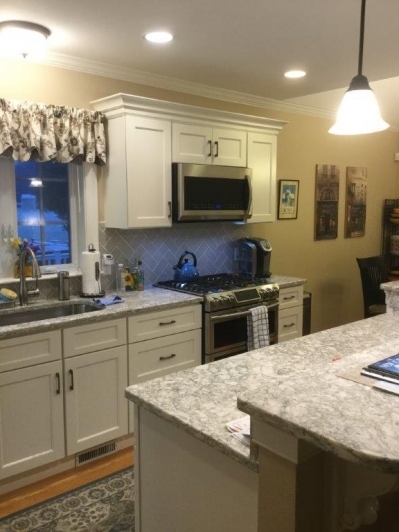 Bringing Yesterday into Today - Wood Palace Kitchens, Inc. I ran across this wonderful couple that lived in a condo here in East Bridgewater. 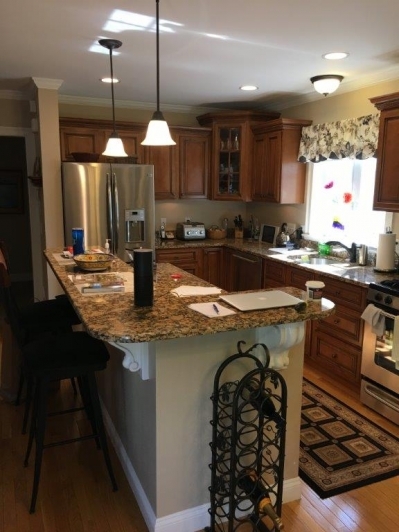 Their original goal was to fix the finish problem that they were experiencing on their existing kitchen. The finish was wearing away on a lot of the doors that were used most often. I presented the problem to our detail finish man and his thought was that there was too much to re-finish. So we moved on to option B with having a painter come in and paint the cabinets. 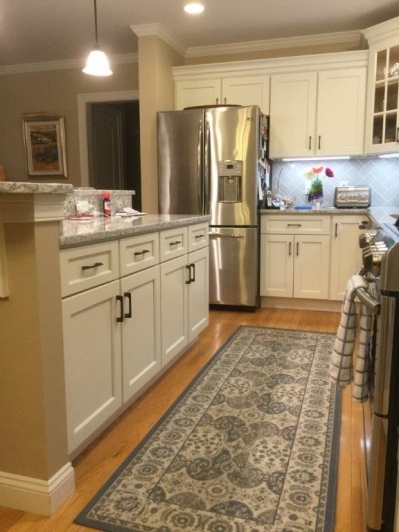 It costs a lot less than replacing the cabinetry, but my concern is always, will it hold up to the every day wear? 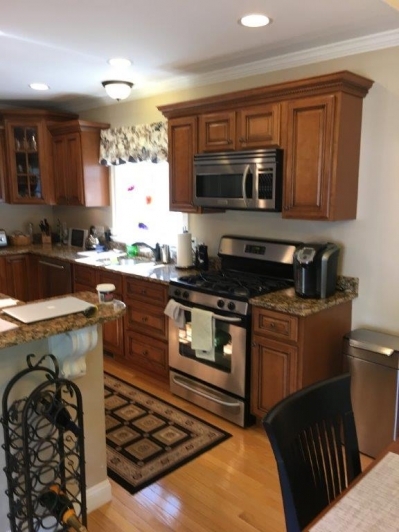 After much consideration about the durability and keeping the old counters, it was decided to re-do the whole kitchen so that we could pick all new, brighter materials and give the kitchen a fresh look that goes with today. I knew it was the right choice, but I always want my client to be OK with what they are choosing. 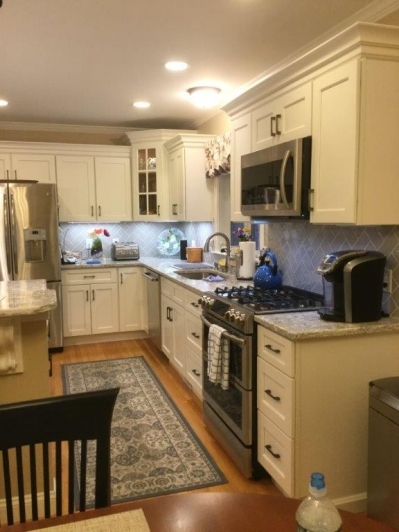 When we go into the world of picking from scratch, I like to keep up with today’s styles and pick materials that go well with the rooms around the kitchen. 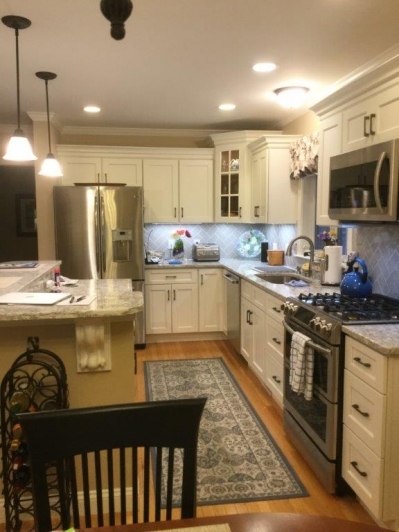 They had recently done over the living room that abuts the kitchen space. The client chose some new and exciting furniture that we could have fun with when choosing cabinetry and counter tops. 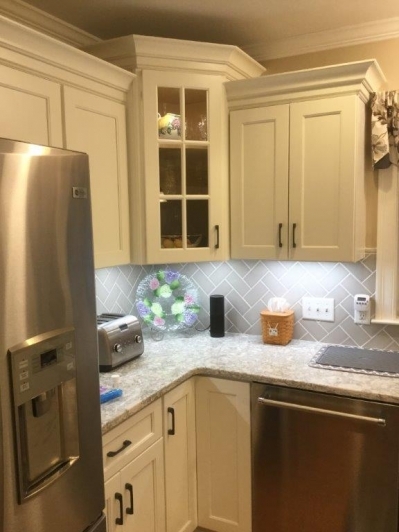 The theme in the living room was light and bright, so I recommended switching from stained wood to a beautiful, soft painted cabinet in an off-white, linen color paint on a simple recessed panel style door that gives the space a transitional feel. 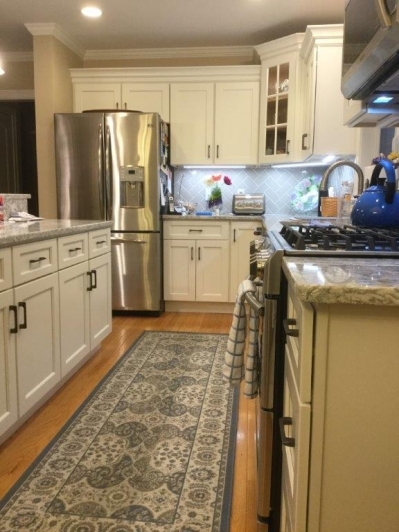 It gives the space a more feminine feel as well, as opposed to the dark, hard feel of the old cabinetry. This color paint went well with her existing wall color. 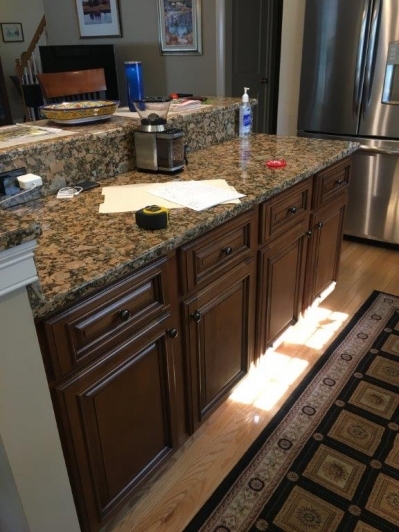 When the counter tops were chosen, granite and quartz were looked at closely. She wanted a lighter, today feel and wanted the material to be maintenance free, so quartz was chosen to top off the new cabinetry. Quartz counter tops have been gaining ground over the last 8 years; for the first time in 2017, it was over 50% of the counter choices over its rival, granite. 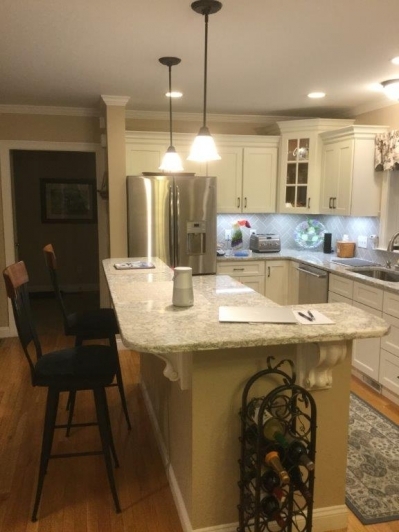 With all of the new colors that the quartz counter manufacturers have been producing, it doesn’t surprise me at all that it has taken over so much of the market share. People want their lives to be much more simple these days, and the materials chosen have to follow that theme. 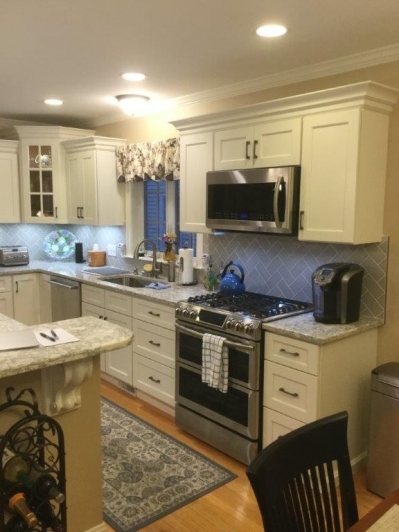 The cabinets chosen for the project were JSI Trenton Recessed in a Linen White finish. 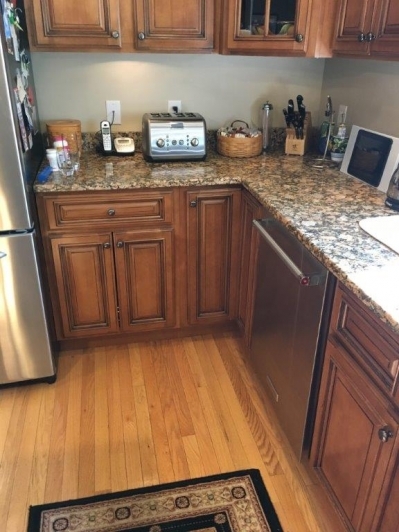 The counters were Cambria in their Berwyn color. 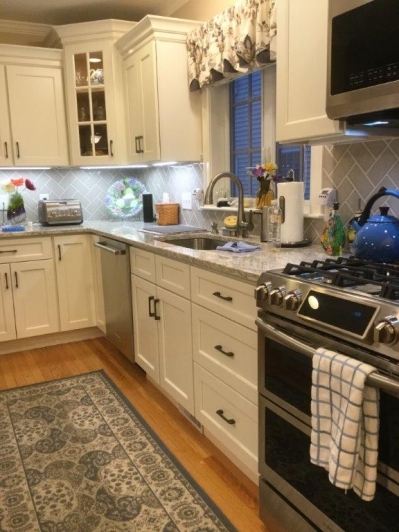 A beautiful grey subway tile in a herringbone pattern was chosen for the backsplash. A stunning oil-rubbed bronze handle topped off the cabinetry like jewelry. 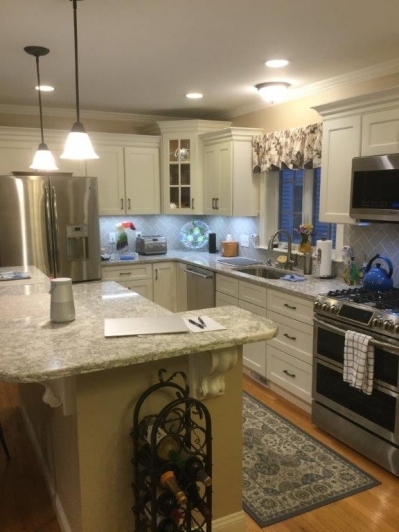 I think you will see in the after photos, everything chosen gave the kitchen that new, “now” look that the client sought. Another project in the books and another happy client that is going to enjoy their new space for years to come!